Located a short walk from Meguro Station, Menya Ishin is very proud of the provenance of its ingredients, and rightfully so. The restaurant uses Mochibuta pork, brand chicken from Nagoya and Akita, and kelp from Rausu in Hokkaido. Menya Ishin’s noodles are made in-house at its other outlet in Yokohama, and served in bowls created in Arita, a Japanese mountain town renowned for its porcelain ware. 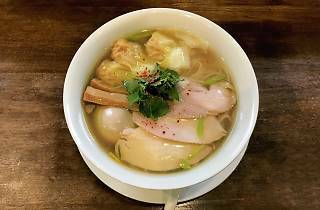 You’ll be glad to know that Menya Ishin offers light and refreshing yuzu shio ramen, with the standard bowl priced at only ¥850. 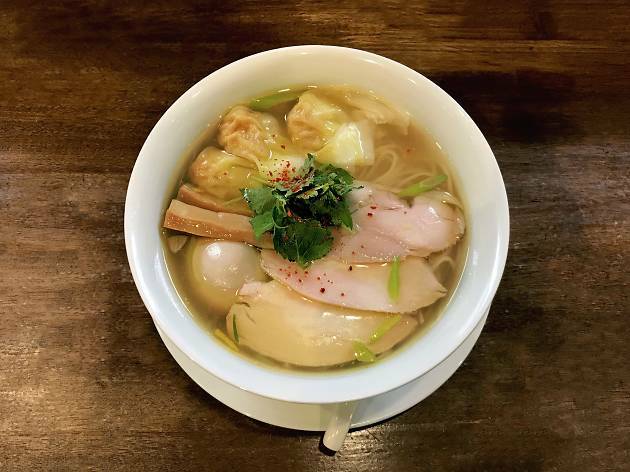 But you’ll be better off upgrading to the special; for ¥1,100, your noodles come with three wontons, three pieces of chicken and a very good soft-boiled egg that has absorbed all the sweet-salty flavour of the shoyu stock it’s cooked in. The little addition of chicken oil in the soup is brilliant, giving the noodles a savoury, smooth mouthfeel. There’s shoyu ramen as well, along with tsukemen plus a limited selection of toppings (egg and charsiu) and side dishes (spicy chicken and grilled pork).